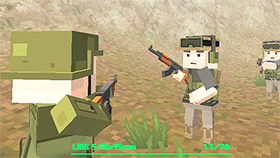 Based on the story of the old versions, Army Recoup: Island 3 brings you more difficult and dangerous tasks. It is still a shooting, action and adventure game. You can play any modern browsers. In that game, you experienced a new background with fantastic 3D graphics. You are on the island again but you have to find the headquarters of the enemy. Your mission is to get information as your commander assigns. You have the support from Air troops if you need, so don’t forget to call them. In that version, you still fight against zombies. Let’s try your best to get the highest score and get a position in the leaderboard. There are many awards for you if you play well. Freegames66.com brings Army Recoup: Island 3 unblocked version to you. It does not require any fee payment. This game is worth for you to spend your free time after busy working. Anytime you want to reduce stress and have a fun time, you can enjoy us. You just a place with an internet connection and click to play.